The ZX Spectrum is a home computer created by Sinclair Research Ltd in U.K. in 1982. Although it is a completely unknown computer in some places of the globe such as the United States (even if a compatible version, the Timex/Sinclar TS2068, was sold there), it has probably been the second most successful 8-bit computer in Europe, and there are still some software houses that create software for it and/or its clones. The ZX Spectrum was the computer that introduced me to programming. I learned pretty much all "secrets" of that computer, including Z80 assembly language. However I has never been able to code anything significant for it at that time because I didn't have any mass storage for it, except for unreliable music cassettes. When emulators came out in late 90s (several years after the actual hardware was out of production) I felt the urge of doing what I couldn't do 10-15 years earlier, this time using cross-assemblers for PC. 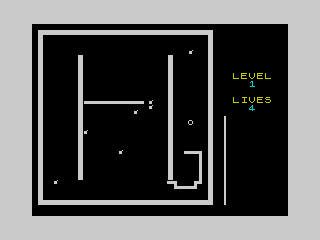 The main "excuse" has been the minigame competition, where programmers were challenged in creating games for their favorite 8-bit computer or console that fits in 1024, 2048 or 4096 bytes (depending on the category). Here you can find the games that I wrote for the competition. Don't expect high quality: this is software for a 30 years old computer, and the code fits in 1k or 4k. This is 1 milionth the size of nowadays games! On the other hand don't think that any of these games required a short amount of time to be written, just because they are 1k (or 4k) of code only. Optimizing the code to fit everything in usually requires at least ten times the time needed to write the same game without memory limitations. 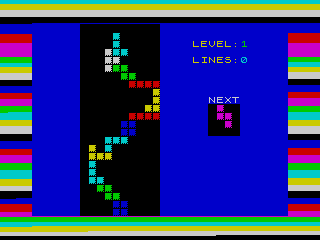 A reduced version of Arkanoid. Can you pass the 16 levels of increasing difficulty? The archive contains two versions of the game. The official competition game that works with a joystick, and a modified one, called 1kanoidk, which requires a mouse! (Clearly it is easier to play it with a mouse). A game similar to Mahjongg. Remove pairs of tiles that can be connected by at most 3 non-diagonal lines. 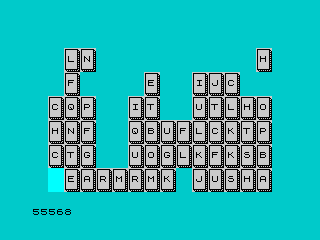 Yes, another Tetris implementation, with music, sound effects, and levels of difficulty. Spectrum 128k is strongly suggested for AY music. 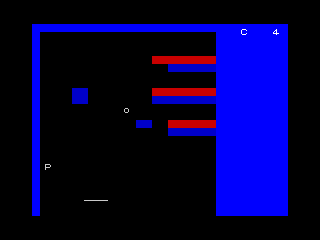 A clone of Snake Race. Two snakes and a bouncing ball. Can you get all apples and escape from all eight stages? I slowed down the game a little bit since the competition. You are at the entrance of a huge maze armed with just one sword. Your goal is to find the treasure and go back to the exit with it. But several monsters called maziacs are here to defend the treasure. 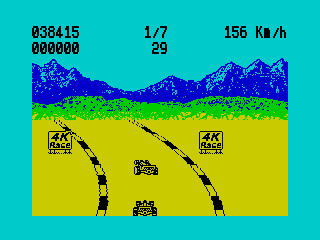 Pseudo-3D driving game, with time limit and checkpoints. 1st Place in the 4k category among 42 games and 15 platforms! Six sudoku puzzles, selectable using key N. Move the cursor using QAOP, 1-9 insert a digit, CAPS+ 1-9 writes a smaller digit, SPACE clears the cell. 4K Race as should have been from the beginning, with better, more involving prospective. Outrun/Super Hang-On style racing game. Run through the 7 checkpoints before time runs out. 1st Place in the 4k category! This is a bug-fix version of the submitted game. New: Timex/Sinclair 2068 extended version. Download the working beta here.